Summer is a busy season for concrete contractors, but the hot weather poses challenges for curing concrete. If it’s too hot outside, concrete will cure quickly and risk losing quality and strength. And if it’s also dry and windy, these three factors combined will increase the risk of drying concrete too quickly. But there are ways to pour and cure concrete in the hot summer months without risking the concrete’s structural integrity. If you’re planning a DIY concrete project, consider the following information and tips for pouring and curing concrete in the summer. What Is the Ideal Temperature for Pouring Concrete? To achieve the optimal concrete strength, the ideal temperature should be maintained at around 12˚ C (55˚ F). However, it is safe to pour concrete with air temperatures between 10˚ C and 32˚ C (50˚ F and 90˚ F). If you must pour concrete outside of this temperature range, take extra precautions to ensure the concrete cures properly. If it is too hot, the water content in the concrete will evaporate quickly, causing the concrete to dry too fast. To pour concrete on hot summer days, make sure to pour the concrete when the temperature is the coolest—i.e. early morning. And keep the concrete wet to prevent it from drying too quickly. Avoid pouring concrete at noon, or during the afternoon when the sun is the strongest and the temperatures are the highest. What Is the Purpose of Curing Concrete? The purpose of curing concrete is to maintain adequate moisture content and temperature so the concrete slab can gain its optimal strength as it sets. Curing is mandatory in concrete construction. 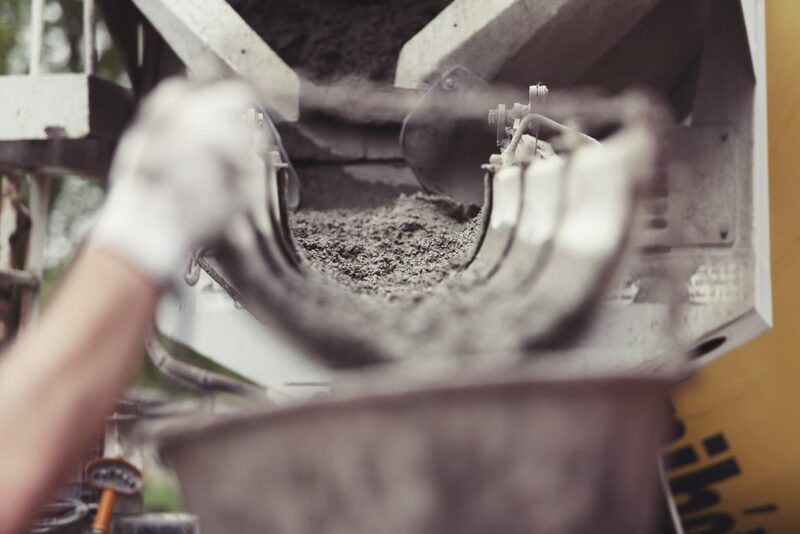 How concrete cures will determine its long-term strength and durability. Concrete sets with a process called hydration. When concrete is hydrating, it absorbs water that bonds the concrete mix together, forming crystals around particles in the concrete. This crystallization strengthens concrete. In cooler temperatures, the hydration process slows down, allowing more time for the crystal structures to strengthen. But when the temperature is too hot, the crystallization process speeds up, leaving less time for the crystal structures and concrete to strengthen. In hot temperatures, water also evaporates from the surface of concrete, causing it to dry out and shrink. This will lead to weaker concrete at the top of the slab that is more prone to cracking. Concrete can reach a solid state before it has completely cured. Properly curing concrete can take up to 28 days to reach its desired strength and quality. What Happens When Concrete Dries Too Fast? When concrete dries too fast, it is difficult to finish, since it loses workability. It will also have an increased rate of slump, so it will not be consistent throughout. Concrete that dries too fast becomes soft, and in some cases, chalky. It also results in a weak and unstable concrete, with reduced compressive strength and durability. If the top of the concrete dries faster than the bottom due to hot weather, the top will shrink while the bottom does not. This results in internal problems that will damage the concrete slab. And shrinkage cracks can appear that will eventually get worse with time. To achieve optimal concrete strength, the top and bottom halves of the concrete slab need to cure evenly at the same rate. What Temperature Does It Have to Be for Concrete to Cure? Concrete will not cure if it’s colder than -6˚ C (20˚ F). But, ideally, it should be kept at a minimum temperature of 10˚ C for at least three days. And concrete should not get hotter than around 32˚ C (90˚ F). Why Do You Keep Concrete Wet? Keeping concrete wet ensures that concrete will cure properly and reach its desired strength. This prevents concrete from drying out too quickly and risking shrinking, cracking, and reduced strength. The cement in concrete also needs constant moisture to gain strength. It’s important to keep your concrete as moist as possible for seven days after placement so it gains strength and shrinks less, creating fewer cracks. Store the concrete mix and materials in a cool place or out of direct sunlight. Use cold water for the concrete mix to keep its temperature down. Ready mixed concrete suppliers use cooling methods, such as adding ice to the concrete mix. Reduce the mixing time once water has been added. Batch and mix concrete at a ready mix concrete plant. Be ready to receive and place delivered concrete so it can avoid prolonged exposure to heat. Keep all concrete equipment covered, in the shade, and sprayed with cold water until the moment you need to use it. Dampen the subgrade and side forms with cold water before pouring the concrete. Do not finish the concrete while water is on the surface. Prevent evaporation by covering concrete with curing blankets plastic sheeting, or spray-on membrane-forming curing compounds. Keep concrete wet with water curing. Either pond or spray the surface periodically with a hose, or turn on a sprinkler to a fine mist, and then cover with wet burlap. Block direct sunlight and wind using sunshades and windbreaks. Use evaporative retarders if the temperature gets hotter and water is evaporating quickly from the concrete. While it’s not ideal to pour and cure concrete in hot weather, it is possible. So keep these tips in mind to ensure your ready mix concrete maintains long-term strength and durability after you pour this summer.